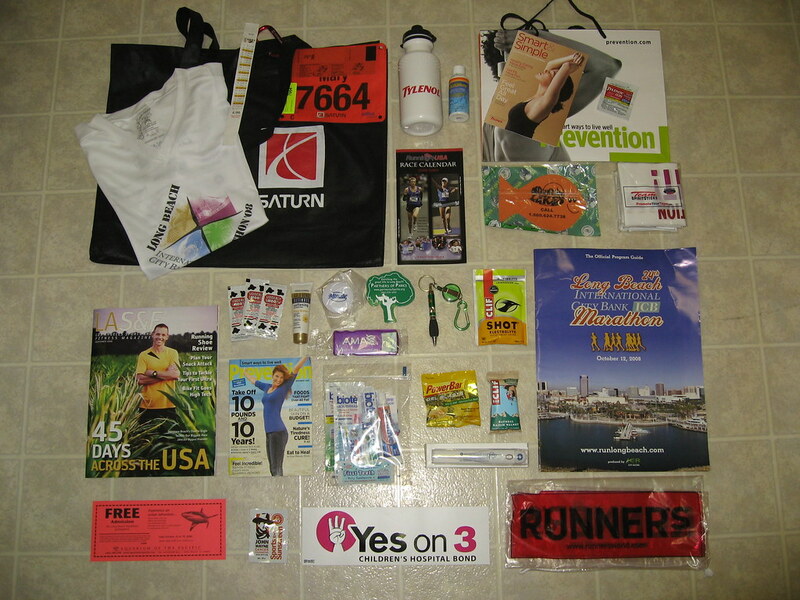 I stopped by the Long Beach Marathon Expo today to pick up my race packet. I registered early so I qualified for a technical shirt. I was pleasantly surprised by how nice the shirts are this year. I also like how the race timing chip is a disposable sticker that was attached to the bib. Tylenol was giving away individual packets of their painkillers and offering free 5 minute chair massages. It felt good to get some of the knots worked out of my shoulders. I picked up a 06:00 marathon pace bracelet from the Clif Pace Team booth. I wanted a 06:30 but 06:00 was the slowest they had. I stopped at the RaceReady booth. I had heard really good things about the RaceReady compression shorts so I was interested in checking them out. They had the Women's Long Distance (LD) Fitness Shorts in black and navy blue. The salesgirl suggested I take a pair to the women's restroom in the far corner of the Expo to try them on for size. The sizes ran small - I usually wear a women's medium but the large fit me perfectly. The stretch material was comfortable and I liked how it felt when I jogged in place in the bathroom stall. I purchased a pair in the navy blue. My only concern is that the pouches in the back might interfere with my hydration belt. If that's the case, I'll avoid wearing them together. I also picked up a bottle of Penguin Sports Wash. I had been reading reviews on this product online and the majority of users felt it worked well. It's laundry detergent formulated specifically for technical fabrics. It helps removed odors that are 'trapped' in the fabric. I'm interested to see how it works. For some reason, I tend to accumulate stains on my running clothes. I have no idea how this happens because I swear I'm not rubbing my body against anything when I'm out on my runs but I often come home with streaks and splashes that refuse to come out in the wash. My current method is to first soak my running clothes in a plastic bucket with OxiClean and then with laundry detergent. Once I've gotten most of the stains out, I will put them in a cold wash in the machine. I am hoping this Sports Wash will eliminate the soaking rounds. At the Sub4 USA booth, the owner, Tom Steiner, demonstrated the DryLyte moisture wicking ability by spraying a piece of fabric with a spray bottle. He had me touch the damp outside and then he showed me how the ribs in the fabric helped wick the water so the other side was dry. I was impressed by how well the fabric absorbed and pulled the moisture away. I purchased 3 pairs of DryLyte moisture wicking wristbands. My wrists get really sweaty and I find leather or rubber watches irritate my skin so I always wear fabric bands. I'm going to wear these wristbands to wipe sweat off my face when I'm running but I also want to try wearing them under a watch. If it's comfortable enough, I might be able to wear non-fabric watch bands in the future.